Holidaying late on in the year seems to be getting more and more popular judging by how many friends and fellow bloggers are away right now (jealous!) so I thought I’d put together a little packing guide to those who are lucky enough to be getting some winter sun. As the temperatures in October and November are generally a little cooler, even in the warmer countries, I’d be packing a mixture of swimwear and statement accessories, with lots of denim, oversized shirts and detailed cover ups. 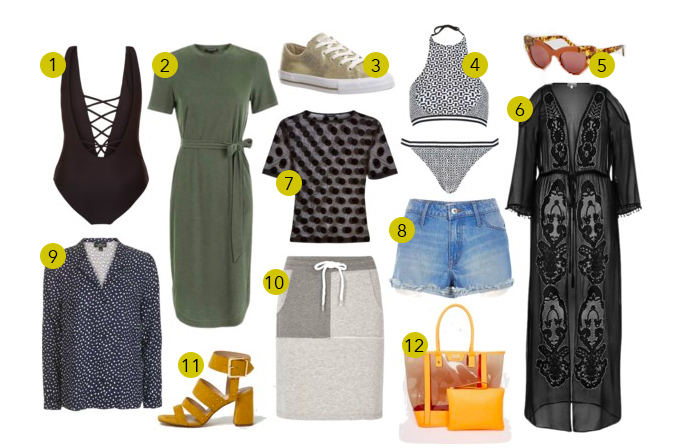 For day time I’d wear a pack a trusty converse, with a simple loose fit tee or cami and comfy sweater skirt thrown over a statement bikini set, or for days spent lazing by the pool I’d pick a glamorous one piece paired with a chic embroidered maxi cover up in simple black. The one I’ve chosen above is perfect for taking from day to night with the addition of a black slip dress underneath and a pair of bold coloured heels. For more relaxed evenings, I’d swap the dress for a classic pair of denim cut off shorts and a loose fit pyjama style blouse like this Tophsop number for a chilled out look. Other essentials that would find their way in to my suitcase would be must-haves such as a boldly printed beach towel, statement sunnies, a bright beach bag with matching clutch for evening, a kindle for some poolside reading, a travel guide book to help me explore the area and the all important sun cream, because even in lower temperatures my pale skin manages to burn! I’d love to be jetting off somewhere this side of Christmas, to somewhere with the perfect balance of good weather, lovely beaches and lots of culture. A place that’s been top of my list for a while now has to be Sicily, what with all of it’s beautiful buildings and temples, and not forgetting the craters of Mount Etna. Then of course there’s the stunning beaches for a spot of sunbathing and bustling little towns for a dose of culture and exploring the local shops. I’ve been eyeing up places to stay and have found a great site called WishSicily that has some lovely villas in Sicily that would be perfect for a sunny escape. I’m counting down the months now until our next break (and probably the last one before we get married!) in April and will definitely be following my own advice for the pieces I’ll be packing as the weather will be a little on the cooler side, but I already can’t wait! Then maybe Sicily could be on the cards for a honeymoon destination? We shall wait and see! Have you got any Winter breaks booked? What countries are on your travel bucket list?